Summer seemed to fly by this year! Is it just me, or are the years getting shorter? Maybe the Earth is speeding up on its axis. Whatever the reason, summer is almost over, and it’s time for your end of summer get-togethers. 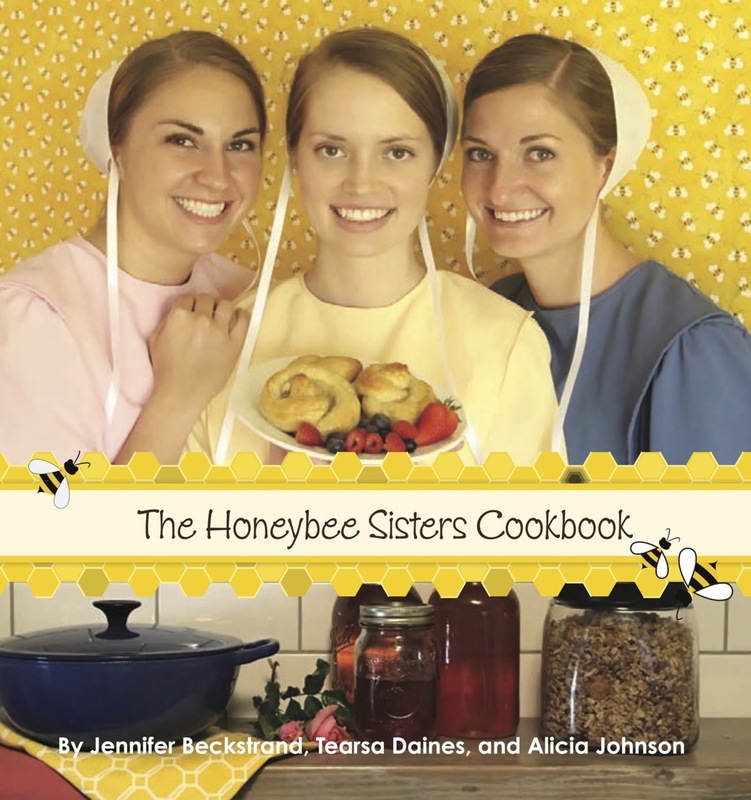 This recipe appears in The Honeybee Sisters Cookbook and is perfect for entertaining. 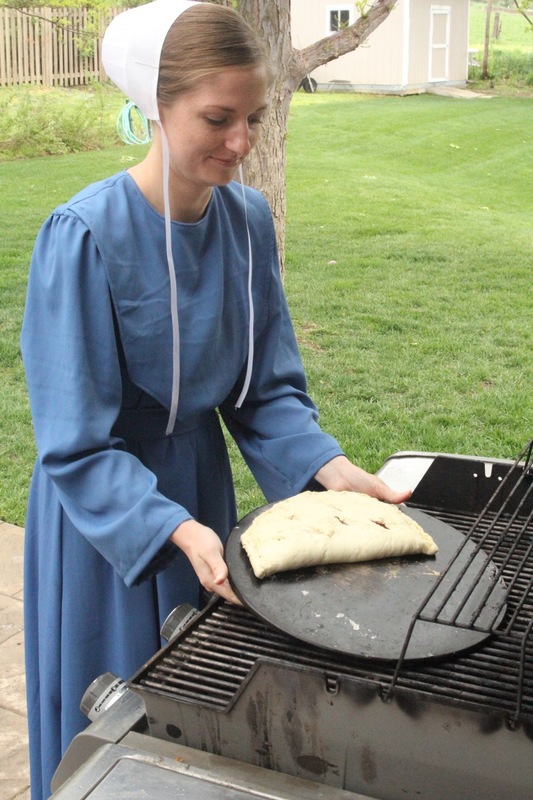 The calzone can be cooked outside on the grill on a pizza stone. That’s something Amish often do to keep their kitchens cooler in the summer. 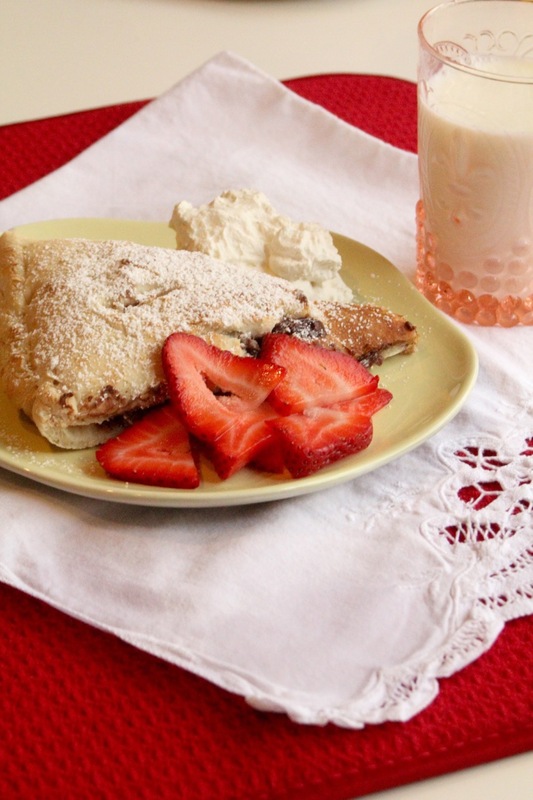 Be sure to spread a generous amount of Nutella! It’s easy to make the edges look pretty. 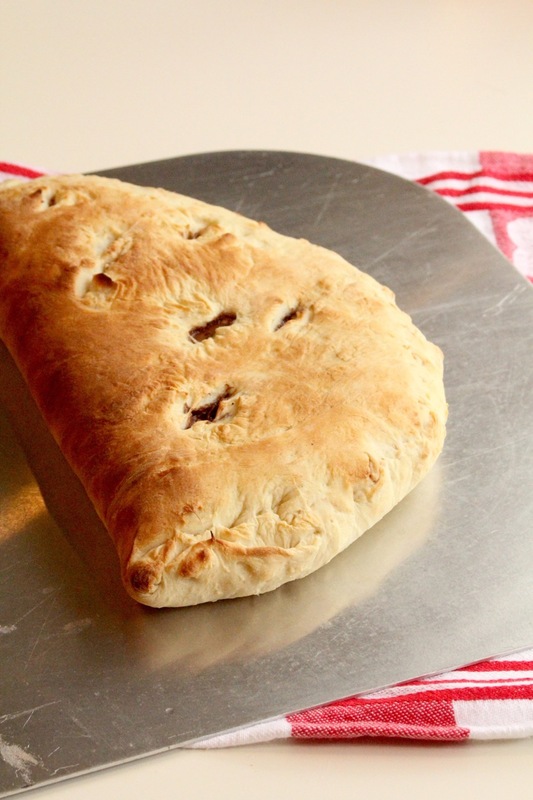 Put the calzone on your pizza stone and bake it on your grill if you want a cooler kitchen. 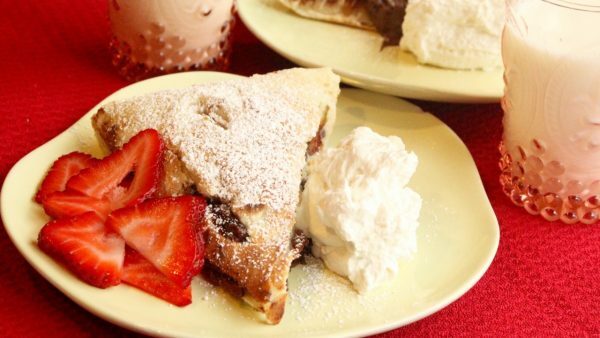 When it’s done baking, slice and top with whipped cream and fruit, if desired. Oh, and Happy Anniversary to me! I’ve been married 33 years. Love you, Gar-dawg. In a large mixing bowl, add 2 cups warm water, honey, and yeast and let yeast bloom. Add salt and olive oil and 3 cups of flour and mix. Continue adding flour, 1⁄2 cup at a time, until dough pulls away from the sides of the bowl. The more flour you add, the thicker the crust. We like a thin crust so I add flour just until the dough is slightly sticky to the touch. Then when rolling out, I roll in about 1⁄4 cup more flour. Let dough rest for 10 minutes and divide into 3 equal pieces. Shape or roll dough into a thin circle and place on pizza stone or cookie sheet. 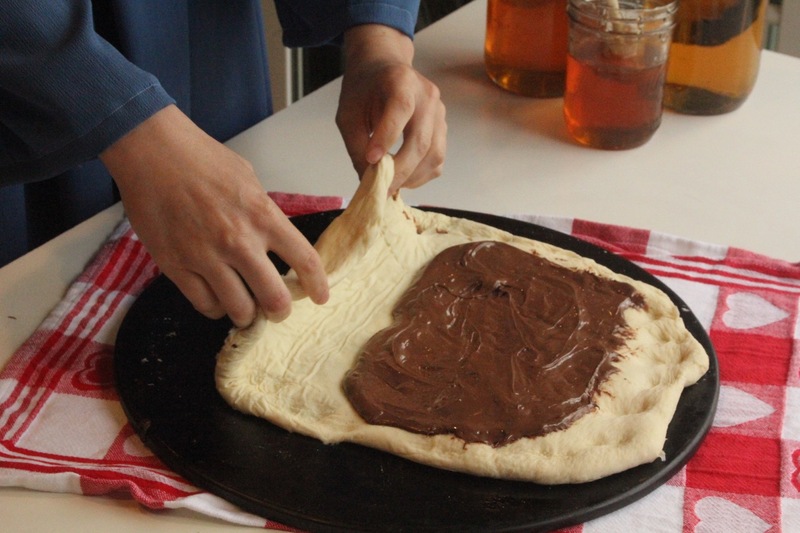 Spread half the dough generously with Nutella, being careful not to spread right to the edge. (Be generous with the Nutella! You should use at least 3⁄4 cup.) Wet the edge, all the way around with water. 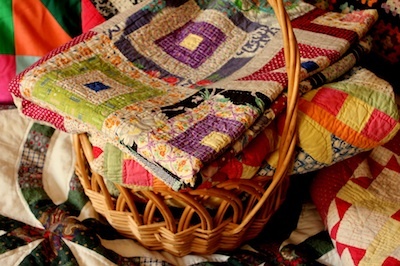 Fold the top over and press the edges together to seal. You can cut closely around the edge to seal. 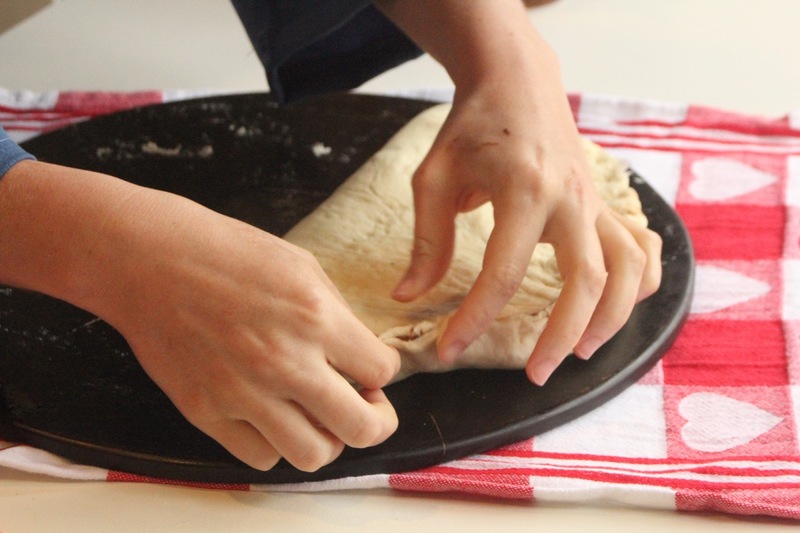 If serving to company, roll leftover dough into a long narrow strip. Cut 3 equal half-inch strips. Braid the strips together to make a long braid. Wet the edge of the calzone with water. 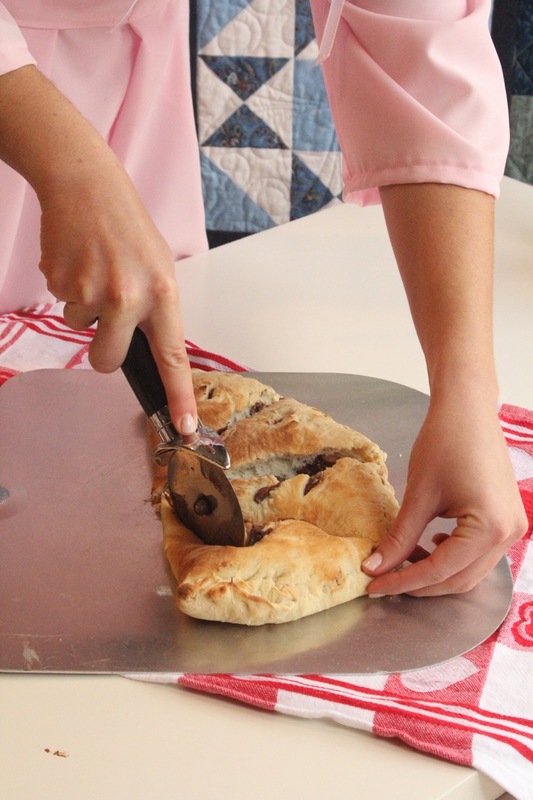 Arrange the braid around the edge of the calzone and press it down lightly. Brush with milk and bake for 6–8 minutes. This can be baked on the grill outside. Sprinkle with powdered sugar and cut into strips. Garnish with berries and whipped cream if desired, or just eat plain. Best eaten while warm so the Nutella oozes out!